Prior to 2018 this reflects our previous recommendations for starting cactus seeds which were posted on this website before we developed Metamorphosisenips Growing Medium, and seed starting kits we currently offer for sale. The information on this web page is on this website as an archive obsolete to our current cactus seed starting method. This information remains in case it may be helpful for anyone interested in growing cactus plants from seed. 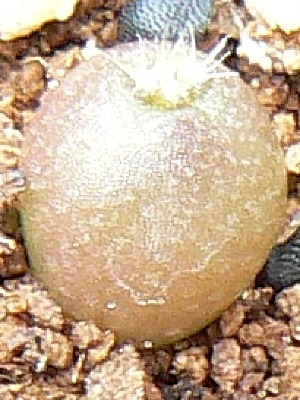 Most cacti seeds can be grown indoors under artificial lights for at least the first few years, but they will grow more with some direct sunlight. There are problems like mold and insects that can completely wipe out new seedlings, and these kinds of problems need to be avoided. Results will vary according to a wide range of conditions like temperature, light, the kind of water and growing mediums, so success in growing cactus plants from seed may take some trial and error methods. The fastest and healthiest seedlings will be the ones that can be grown outdoors in sun light, but there are still many problems to avoid whether seedlings are grown indoors or outside. The following is a simple and effective method for growing cactus seeds indoors. Cactus Seeds; most likely web sources where cactus seeds may be purchased. Distilled water; tap water will be more likely to encourage bad molds, usually a grocery store purchase. Plastic seed starting trays or plastic flower pots; found on the web or at greenhouses. 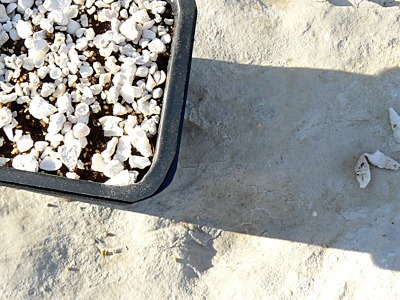 Wonder Soil; the Expanding Pro Planting Mix version is the easiest to work with, found on the web or at greenhouses. Aragamax versions and/or Aragonite versions of Crushed Coral by CaribSea; these are salt water aquarium pet supplies easily found on the web or at local pet stores. Plant Growing Lights; or well sun lit window, found on the web or at greenhouses. Heating pad; unless the soil temperature can heat up to over 80 degrees without a heating device, found on the web or at greenhouses. To get ready to plant seeds saturate the Wonder Soil with distilled water to maximum amount of water the Wonder Soil will absorb in an hour. Avoid letting the Wonder Soil sit in water longer than the time it takes for it to become completely soggy. If the Wonder Soil remains in standing water for a few days the microbial chorology will change; so that cactus seedlings will die, and continue to die for over a week even when new healthy seedlings are introduced to the changed medium. The key to growing cactus seedlings in Wonder Soil is to alternate the growing medium between completely wet to completely dry again and again. Next place the saturated Wonder Soil in the plastic growing tray or flower pot and gently press it down to conform to the container. You may want to label the pot with some sort of permanent marking pen or add an identifying tag of some kind to label the cactus species. Next the seeds can be planted. Our recommendation is to leave the seeds sitting on the surface of the Wonder Soil, unless working with large seeds like Opuntia. To plant the cactus seeds gently scatter them on top of the very wet Wonder Soil. Next scatter a thin layer of Aragamax versions and/or Aragonite versions of Crushed Coral by CaribSea. 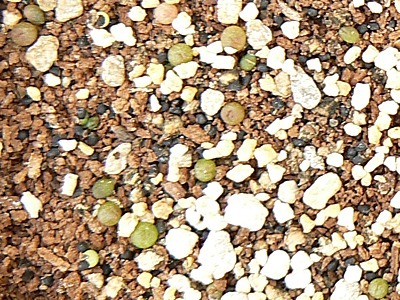 The finer versions of Aragamax work better for small seeds, but seedlings will grow their way through the larger versions of Crushed Coral too. This material will prevent damping off and will help increase the number of seedlings which survive into becoming juvenal plants. It is normal to expect a few seedlings to die off, but, fungal infections starting in one seedling can turn out to kill off all the seedlings in the container. These products can radically reduce the risk of fungal infections with small amounts of coral scattered on the surface with the seeds or seedlings. The sea coral products seem to be less effective mixed in with soil and more effective on the soil surface. Watering procedures are important to understand to stimulate germination and maintain growing seedlings. In the beginning keep the medium as wet as possible for at least 2 weeks and then slowly allow the Wonder Soil to dry out almost completely at the end of 6 weeks. Seed need a lot of water to germinate, and spraying the surface daily with distilled water provides the most control for keeping the seeds super wet and gradually drying them out over time. Some, all or even none of the seedlings may germinate in the first 6 weeks, but in every case it's always likely more seeds will germinate later. Sometimes more seeds will germinate along growing seedlings 1 or 2 years later. After the initial very wet first 6 weeks it becomes important to cycle the seedlings or latent seeds through very wet to very dry conditions over a 2 week cycling periods. Soak the Wonder Soil with distilled water until it's completely wet, but not left in standing water over night. Over the 2 week cycle top spray the seedlings with just enough distilled water so that the container ends up dried out at the end of 2 weeks. Another option is to soak the Wonder Soil and simply wait for it to completely dry out before soaking it again if you have reservations about daily top spraying the seedlings. Cycling between wet and dry conditions gives cactus seedlings the right conditions to grow and remain healthy. 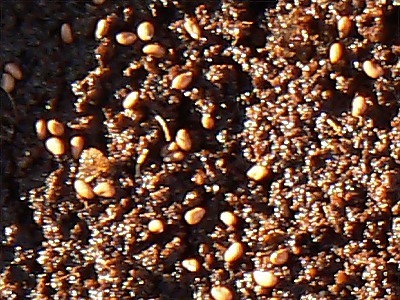 This method also provides disadvantages for harmful molds and soil flies to kill the seedlings, and it somewhat imitates the conditions cactus seedlings would have in habitat. The advantage of including this product is to reduce the risk of fungus gnats, shore flies and other small flies from using the cactus seedlings to raise a litter of young maggots. If you live within a few miles of a body of water like a rivers and lakes, or if you have broad leaf house plants it is likely that some sort of small fly species may lay eggs on the cactus seedlings. Some larva feed on cactus seedlings by living inside and hollowing them out, and others live on the outside of the seedling to feed on them by sucking fluids out through the skin. Either way the seedlings will die because these maggots cause fungal infestations and are a common reason for cactus seedlings to damp off. If you are going to germinate; Glandulicactus, Pediocactus or Sclerocactus this product is almost an absolute must have item, because these seedling species are especially vulnerable to fly larva infestations. Most species of cacti will outgrow their vulnerability to fly maggots in a few months but these previously mentioned species will remain vulnerable for the first three years of life. Apply this product by scattering some granules on the surface of the Wonder Soil along with the Sea Coral product of choice. It is important to not cover the planted seeds with a clear plastic germination top or plastic bag, because the Mosquito Beater granules will begin to mold if the humidity is too high. If the granules do mold the seedlings should still germinate and remain unaffected by the molding granules, but it does indicate that the growing environment is being over stressed by too much humidity. For most species of cactus seedlings a few applications every eight weeks will get them through their vulnerable stages, but for Glandulicactus, Pediocactus or Sclerocactus this product is worth reapplying every few months of a few years. The greatest cause of cactus seedling mortality in a more humid four seasons climate will likely be due to soil flies or shore flies,a and these small insects are often also called fungus gnats or Sciara flies. These are species of small flies who are attracted to decomposing organic matter and whose larvae often feed on the roots of plants. Here in Wisconsin I've observed 4 distinct species of flies in their larvae stage feeding on cactus seedlings, but unfortunately I lack enough knowledge to identify them by their scientific names. There is a greenish bodied kind with a darker head that feeds inside of the seedlings until they are hollow. This species only seems to be interested in very young seedlings and the damage they do is very easy to notice. They are present in the summer months both indoors and outdoors, and only seem to be active in the warm weather. 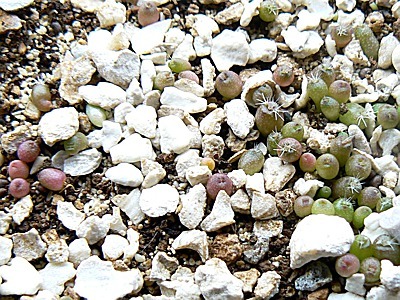 Other species which thrive on house plants may be present all year long and can attack cactus seedlings even in winter. A species of fly which makes a very small translucent maggot feeds mostly on the roots of cactus seedlings and are very hard to detect. They do a lot of damage and can go completely unnoticed until nearly all of the seedlings in a pot are dead. The seedlings turn dark , shrink and if they are already developing spines it is even more difficult to see that they are dying. After the maggots have done their damage they leave behind shrunken empty rootless spine covered dark shells, which use to be cactus seedlings. Another kind of maggot, which may actually be a kind of shore fly is larger than the others and yellow like a very small banana slug. This one stays under the soil and feeds on the base of the plants, but it is very hard to find, and causes the seedlings to rot from the roots up. The stem part of the plant looks healthy while the roots are shriveling away and then the remaining stem rots and usually turns to a fluffy ball of mold. Seeds can be purchased using the list on our home page.